The ultimate in hand protection, Resurgence gloves combines the street-smart cred with the latest tech. 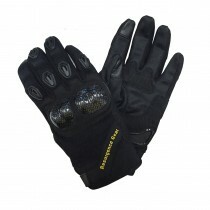 With vented finger protectors, the tips are furnished with Leather Touch Panels- useful for making those quick calls on your mobile or when fiddling with your GPS. In addition to the CE Level 2 PEKEV®-lined interior, additional armor includes carbon-fibre knuckle protector as well as a thermoplastic polyurethane shell on the lower palm.